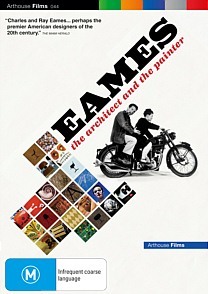 Eames: The Architect and the Painter DVD Review Eames isn’t quite as immediate or as affecting as some of the other entries released under Madman’s Arthouse imprint, such as Herb and Dorothy or William S. Burroughs: A Man Within. 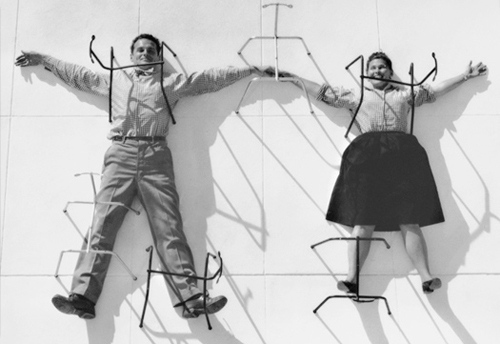 Though primarily remembered for their considerable contribution to the fields of modernist architecture and furniture design, married couple Charles and Bernice ‘Ray’ Eames turned their hands to a variety of mediums in their decades-long personal and creative partnership, including film, photography, graphic design and fine arts. So all-encompassing was their artistic collaboration, in fact, that the two are rarely referred to as separate entities. They are listed in Wikipedia and many books on design as ‘Charles and Ray Eames,’ and in the present day, as in their own heyday of the 1950s and 60s, usually referred to as such. This seems somehow entirely appropriate, not due to any airy-fairy ‘single soul dwelling in two bodies’ hokum but because the two so thoroughly complimented each other in almost every sense, be it personal, creative or financial. As the title suggests, Charles Eames started his working life as an architect, though his real passion (bordering on obsession) was furniture design. His pioneering moulded plywood designs were both simple and stylish, earning him both a lucrative living and a place in the Pantheon of great 20th century designers. Owing both to the sexual mores of the day and her own reticent personality consumers and fellow designers were slow to appreciate the contribution of Eames’ wife Ray, who in addition to being a designer was also an accomplished artist, though as the present film makes clear this visionary and brilliant woman has since been accorded her due share of recognition. Eames isn’t quite as immediate or as affecting as some of the other entries released under Madman’s Arthouse imprint, such as Herb and Dorothy or William S. Burroughs: A Man Within. The characterisations drawn aren’t perhaps as well-rounded as they could be and we don’t truly feel we know Charles and Ray Eames at the end of the film. Viewers are repeatedly told of the charisma and magnetism of Charles in particular, but are given all too few glimpses of it. Fascinating snippets of the Eames philosophy are projected with little further discussion, and there is too much emphasis on interviews with employees and coevals and not enough time on-screen footage of the couple in action. Don’t get me wrong - Eames is still an accomplished and painstakingly crafted exploration of the lives of these two pioneering artists. It’s truly very good. But it could have been brilliant. I’d never thought of perpetually stoned actor James Franco as narrator material, but he has a clear regard for his subjects and actually does quite a respectable job. The 5.1 audio track is clean and crisp, with a lovely original score courtesy of composer Michael Bacon and little hiss or corruption to speak of on even the oldest period footage. The picture is presented in Madman’s typically blemish-free 16:9 for the most part, with one or two sections showing some grain due to the age and quality of the film stock used at the time. All up though it looks and sounds excellent, and the strong visuals and vibrant colours neatly compliment the artistry of the Eames worldview. Twelve minutes of Deleted Scenes, and a smattering of trailers.